You know, Momus is probably the only musician in the world who could pull this off. Basically, he told people that if they'd give him $1000, he'd write a song about them, or at least the first 30 people who signed up. Now, any other living pop star that did this would get laughed right out of musical history, but Momus got probably hundreds of requests for this project. This is because Momus is an incredible, brilliant songwriter, and having him write a song about you is on par with hiring Michelangelo paint a portrait of you to hang in your living room. These people got their money's worth, and so will the people who buy this disc. 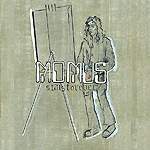 From the sweet song about going to the park dedicated to a 3-year-old (commissioned by his parents) to the numerous publicity people, Japanese girls and record labels portrayed in these songs, Momus covers all the popular (and some unpopular) genres of popular music - including rap, which I've never heard him do. There's lot of baroque/Wendy Carlos influence in here, and one really beautiful, schmaltzy love song (commissioned as one man's marriage proposal to his girlfriend) that I'd normally hate because of the near-Celine Dion-esque qualities, except that the lyrics are so painfully honest and humble and trademark Momus borderline self-loathing, that it's actually my favorite. The last 8 tracks here are the winners of the Momus Karaoke contest, which are pretty cool, and there's also a 21-minute interview with Momus included here that might be fun for people who don't have to do interviews for a living (ugh - but really, it is an interesting listen).